My first concert was at the Steel Pier in Atlantic City. The Steel Pier was an entertainment complex, with various shows, including an aquatic show of some type at the end of the pier. At one time I think that involved a horse that dove into a wading pool from a high platform with a rider on his back. That was featured in the movie “Wild Hearts Can’t Be Broken.” But by the time I went, it was a more mundane dolphin or sea lion show. 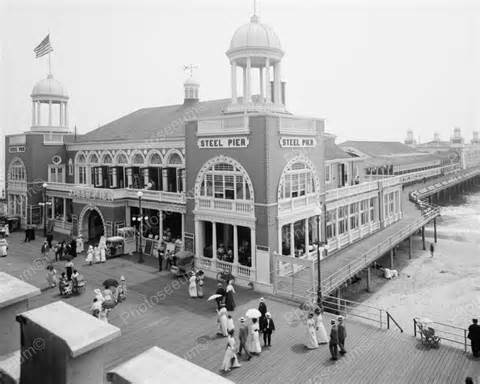 The Steel Pier originally opened in 1898. It was a turn of the century version of what we now call a theme park. You paid one admission and went to all the shows and on all the rides. There was an auditorium in the middle of the pier where music acts performed. Acts ranging from Al Jolson to Frank Sinatra to the Beatles had performed there. So the family was spending a summer day at the Steel Pier sometime in the mid-50’s. My mother took me to see Bill Haley and the Comets. They sang “Rock Around the Clock.” Then they did this long instrumental thing in which each member of the band was introduced and played a solo. Then they sang “Rock Around the Clock” again and it was a wrap. Couldn’t have been more than a half-hour show and they probably did it every hour on the hour. Cool of my mom to take me. No clue where my father was. This was pre-gambling Atlantic City so good chance he was in a bar. My next rock concert was more than a decade away when I saw the Beach Boys at Newark Symphony Hall in the 60’s. The Steel Pier still exists and still exists as an entertainment complex. During its century plus of existence it has been destroyed numerous times by storms and fires and is in a constant state of renovation. But Atlantic City has been described as a place for dreamers and one of those always pops up with plans to restore the Steel Pier to its former glory. This entry was posted in Growing Up in the 50s, History and tagged 50's, Atlantic City, Bill Haley and the Comets, history, music, Steel Pier. Bookmark the permalink.